講師：Did you get today's lessen article? 講師：Great! Then let's get started! Firstly, Could you read out loud the first section of article The "Unlocking word meaning" section, please? 講師：Good! Okay, next, please read out loud the Article section. 講師：Good! Now, do you get the gist or or do you have any questions about the article ? 講師：Why were some meat-processing plants raided? 私：Because they were suspected of bribing authorities to get certification for poor-quality meat. 講師：How many countries does ○○ supply meat to? 講師：Yes, that is a lot! 講師：Okay, so, why did ◆◆ lift their ban on ○○ meat products? 私：Because there were no exporter which deal products in question. 講師：Okay, now. How can I do to avoid those suspicious imported meats? Please tell me your opinion. 私：We should confirm where is the meats every time we buy meats.We had better have ourself trusted store. 講師：Yes, that is great idea. By the way, do you have a market in your area? I mean wet market. 私：I think so, yes, but I don't go there often. 講師：Oh, I see. So, where do you normally go to buy meats ? Some super market? 私：Yes, local super market. I sometimes go seafood market. 講師：Normally when you go to super market to buy your groceries, do you buy for a week or for just few days? 私：I usually go to groceries shopping once a week. Hello ○○-san! Thank you for booking my class. I would like to commend your active participation during our lesson. You did well during the discussion. 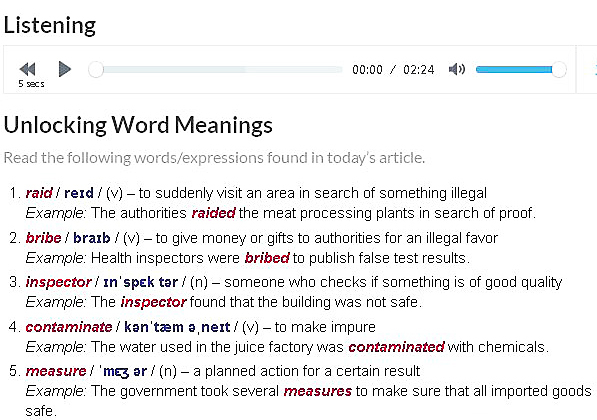 Try to use the vocabulary words that you have learned. Remember to read English articles everyday to increase your vocabulary bank and you may also watch English movies, news and documentaries to enhance your comprehension more.